Russian musician; born at Odessa 1851; died at Leipsic Aug. 8, 1887. He was an accomplished pianist at the age of thirteen, and obtained a position in the Italian opera-house of Kishinef. In 1868 he was sent to the Leipsic Conservatorium, where he studied under Moscheles and Reinecke. 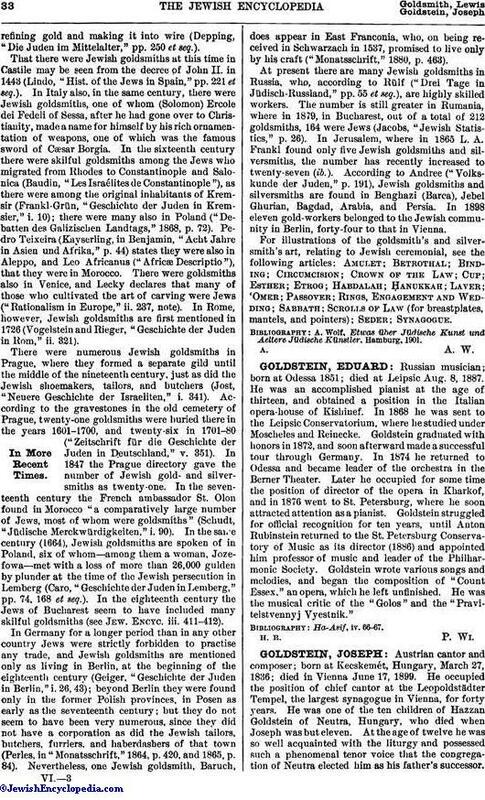 Goldstein graduated with honors in 1872, and soon afterward made a successful tour through Germany. In 1874 he returned to Odessa and became leader of the orchestra in the Berner Theater. Later he occupied for some time the position of director of the opera in Kharkof, and in 1876 went to St. Petersburg, where he soon attracted attention as a pianist. Goldstein struggled for official recognition for ten years, until Anton Rubinstein returned to the St. Petersburg Conservatory of Music as its director (1886) and appointed him professor of music and leader of the Philharmonic Society. Goldstein wrote various songs and melodies, and began the composition of "Count Essex." an opera, which he left unfinished. He was the musical critic of the "Golos" and the" Pravitelstvennyj Vyestnik."